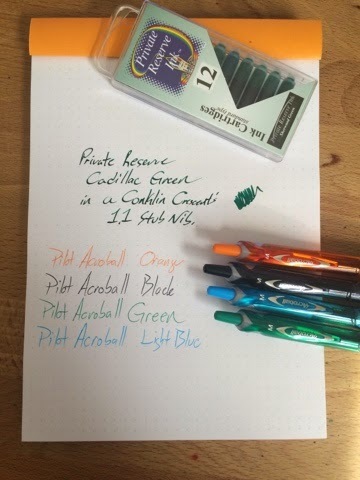 A side-trip to the pen store today. | Inkdependence! I spent most of the day at the J.C. Raulston Arboretum learning about bees and pollinator gardening, but I got to stop by the Office Supplies & More shop in Chapel Hill on my way home and came away with a few goodies. Just a few. The Triangle Pen Show is coming up in a couple of weeks, and that's gonna be great. Those Acreoball pens are some of the only ballpoints that I can stand to use. They're really great, but hard to find in non-blue around here for some reason.